Italy: Sicily, Naples, Rome, Florence, Pisa, San Gimignano, Venice, Verona. Greece: Mykonos, Santorini, Athens. Malta: Valletta. Square, Gondola Ride in Venice, Acropolis, Parthenon, Mars Hill in Athens, the most beautiful island – Santorini, Valletta, Malta, the island of Sicily, Pompeii, and Sorrento. Special Guest Educator: Dr. Michael Wilcox. This special Cruise & Land Tour has it all. It gives you the very best of Italy, Greece, and Valletta, Malta. 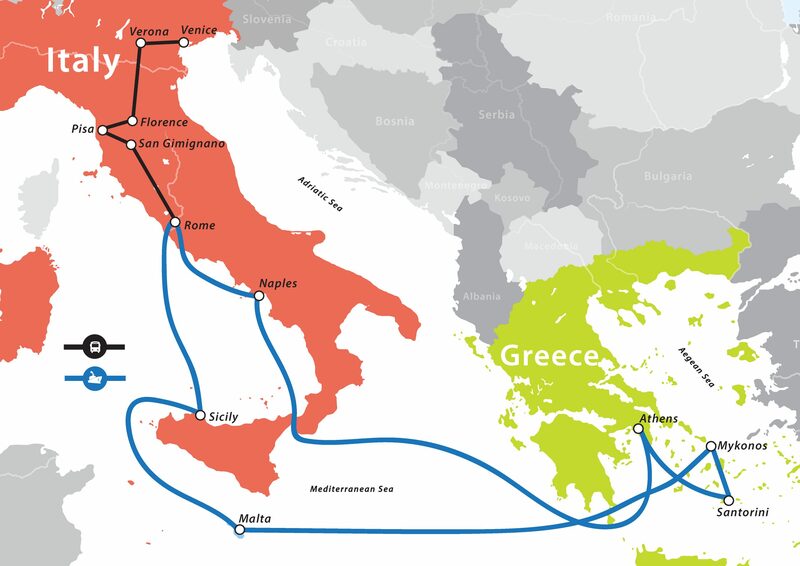 If you have ever dreamed of doing Italy and Greece, jump on board. This fantastic vacation is for you! Italy is hard to see from a ship as there just isn’t enough time in port to really experience cities like Rome and Florence. With our well-planned land tour, we will be able to take the time to really enjoy Rome and Florence as well as visiting places the ship does not stop – places like San Gimignano, Tuscany, the Italian countryside, so much more. We even visit Verona, home of Shakespeare’s Romeo and Juliet. Throughout your land tour, we will stay in deluxe hotels and tour in deluxe buses. We have added to your land tour of Italy a wonderful 9-night Mediterranean Cruise that includes the following ports of call: Naples, (Pompeii) Italy; Sicily, Italy; Mykonos, Greece, The most beautiful Island in Greece – Santorini, Athens, Greece and Valletta, Malta. This really is a great cruise that offers the best of Italy and Greece. To make everything even better, your guest educator will be Dr. S. Michael Wilcox. He is the very best educator for this part of the world. He can bring to life the history and magic of all that you will see and experience. 9-night cruise inside cabin on Royal Caribbean’s Jewel of the Seas to Rome, Sicily, Mykonos, Valletta, Santorini, Athens, and Naples. $270 in ship port charges and fees. Deluxe hotels in Rome, Florence, and Venice area. All transfers to and from airports, hotels, and ship. All tours, buses, and guides in Rome, Florence, San Gimignano, Tuscany and the Italian countryside. Fun For Less Tour Staff throughout your tour and cruise. Shore excursions are not included: You have the option to purchase our discounted shore excursion package. Airfare is not included. You have the option to purchase our group airfare. *Per person cash discount price, based on double occupancy. Does not include International air, tips or the optional Paris Temple Extension. If someone is doing the Paris Temple optional extension it does not include airfare between Rome to Paris. The price of this internal flight is $148. We depart our home and travel to Venice. This morning after arriving into Venice we will drive the short distance to Verona, home of Shakespeare’s Romeo and Juliet. This is one of the most picturesque old cities in Europe. After a tour of the old town, you will have time to explore and have lunch at one of the many sidewalk cafes. This evening we will head to Padova to overnight at your deluxe hotel. We will spend the morning touring and exploring Venice. After our tour, you will have plenty of time to walk the many old streets and bridges found in Venice. You will also have time to enjoy a gondola boat ride and eat in one of the many quaint sidewalk cafés. This afternoon we will travel to Florence where we will be staying the next two nights. We will have a full day to enjoy Florence and all that it has to offer. We will spend the day visiting the center of the Renaissance, whose liberating ideas helped pave the way for the reformation. This city is the home to the Medici family, Michelangelo, Leonardo de Vinci and Dante. We will take a guided tour of the old city, visiting such sites as the Piazza del Duomo, including the beautiful Baptistery Doors that inspired Michelangelo. We will also visit the original statue of David in the Academy Museum. You will have time to shop in the old streets of Florence and also time to enjoy the many sidewalk cafes before returning to our hotel this evening. We will spend the will spend the day traveling through the Tuscany Countryside visiting small villages, San Gimignano and Pisa before heading to Rome where we will overnight. Today we will visit a separate country, Vatican City. We will visit St. Peters Basilica (the largest church in the world), St. Peters Square, the Vatican Museum, and the Sistine Chapel. This morning we will visit the magnificent Coliseum and the Trevi Fountain, which has been made famous by many movies including “Three Coins in a Fountain”. Mid-afternoon we will head to our cruise ship to check in. Today for those on our optional excursion in Messina, Sicily, we will visit Taormina (about 1 ½ hour drive) where we visit the ancient Greek Theater and have some free time to explore. For those who purchased our optional shore excursion, we will visit Valletta. When UNESCO named Valletta a World Heritage Site, it described it as one of the most concentrated historic areas in the world. Today will be a free day to relax and enjoy your day at sea. 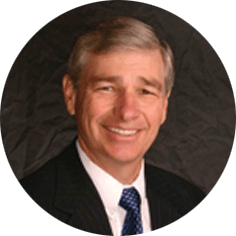 We will also be hearing from Dr. S. Michael Wilcox today. Today will be a free day to explore the beautiful island of Mykonos. If you want you can purchase a shore excursion package through the cruise line. Not all islands are created equal. Santorini is a 10 on a scale of one to 10 and is the most beautiful of the Greek Islands. For those who purchased our optional shore excursion package will have a tour of this beautiful island. For those who purchase our optional shore excursion package will have a wonderful sightseeing tour of Athens and the Acropolis. There is a lot of walking on this tour, including stairs, make sure that you have good walking shoes. Some of the sites you may see along the way include; the Temple of Zeus, the Tomb of the Unknown Soldier, the Parliament, the Presidential Palace, and the Panathinaikon Stadium. The tour highlight will be the Acropolis where you will travel 150 stairs up to the top of this famous hill. We will see the Propylaea Entrance, the Erectheum, the Temple of Wingless Victory and of course the Parthenon. Today will be another day to relax on the ship and time to enjoy our guest educator: Dr. S Michael Wilcox. For those who purchase our optional shore excursion package, we will drive along one of the most beautiful coastlines in the world on our way to the city of Sorrento. Sorrento is fabled to be home to the sirens who attempted to lure the mythological figure Ulysses onto the rocks. We also take you to the fascinating city of Pompeii which was buried by Mt Vesuvius in 79AD. You will be able to walk through the ancient streets that are considered to be the very best example of ancient Roman life. Pompeii was home to many wealthy ancients who craved a leisure lifestyle. For this reason, Pompeii is home to many lavish baths, temples and richly decorated mansions. As the ash and pumice stone rained over Pompeii time stood still, preserving life as it was in 79AD. This morning we arrive back into Rome. After clearing the ship we will visit the Rome Temple before heading to our deluxe hotel. This morning we will head to the airport for your flight back to the US and home or on to the Paris Temple Extension. You will arrive home the same day. This morning we will fly to Paris. Upon arrival, we will visit the Paris Temple. Later we will drive to the hotel. (Important Note: The flight from Rome to Paris is not included in the tour price. It is $148 for this flight). This morning we will drive to Versailles, the opulent palace of the Kings of France. We will tour the inside of the Palace. We will also visit the Louvre Museum and its Mona Lisa, tour Notre Dame Cathedral, visit the Eiffel Tower and have time to explore a little on your own.